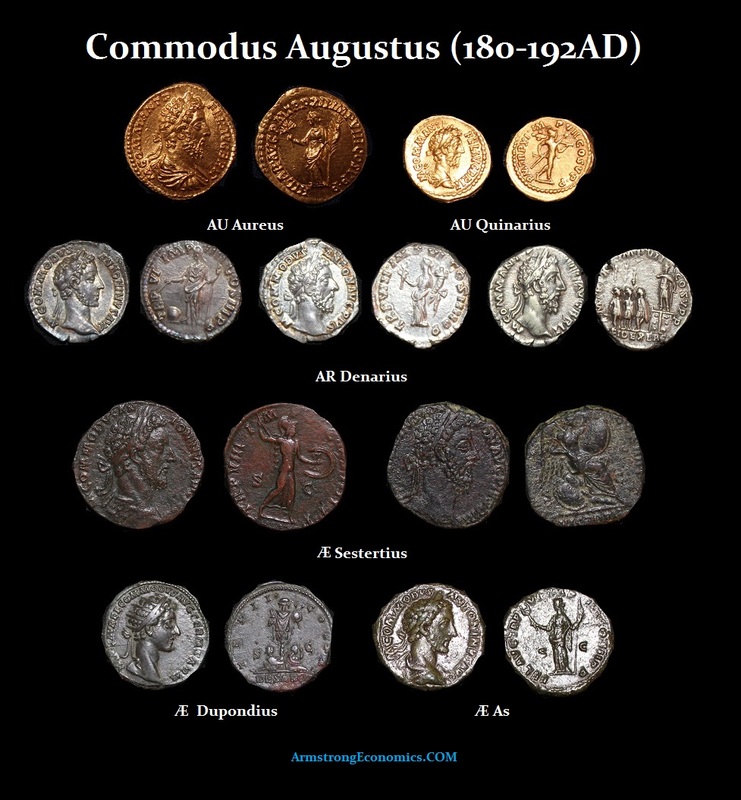 L. Aelius Aurelius Commodus was the son of M. Aurelius and Faustina Junior and was born at Lanuvium inA.D. 161. He was made Augustus and co-emperor in A.D. 177 and accompanied his father to the second Germanic War. On the death of Aurelius in 180, Commodus concluded a peace with the German and Sarmatian tribes and hurried back to Rome. There were great hopes that he might continue the fine tradition of Antonine government, but he proved a most unworthy son of a noble father. He soon retired from public life and left the administration of the Empire to a succession of favorites – first Perennis, then Cleander and finally Laetus. During his last years, he seems to have gone completely mad. For fourteen days before he was assassinated at the end of 192AD, Commodus put on one of the most lavish and spectacular gladiatorial games Rome had ever seen. Commodus himself was the star attraction. This seems to be when he believed himself to be the reincarnation of Hercules and issued coins picturing him as such. The people did rush from all over Italy to witness the spectacle of an Emperor performing in the arena. Commodus killed various beasts including a rhinoceros. Nonetheless, this slaughter was simply the warm-up act to the main event which was the emperor would fight as a gladiator. This, of course, disgraced the office by fighting wild beasts and appearing as a gladiator in the amphitheater. Still, his insanity turned to megalomania and he not just believed himself to be the reincarnation of Hercules, he also demanded the worship of the people as such. 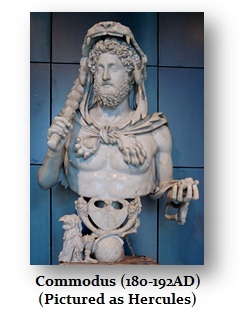 Commodus even named the month of October after Hercules. This lasted only during his reign. That was no doubt the final straw. After numerous unsuccessful plots against his life, he was eventually murdered on the night of December 31st, 192AD. 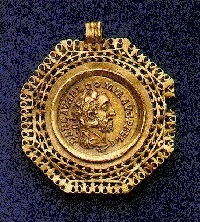 Here is a gold aureus which had been mounted as jewelry during the 3rd century. It was part of the famous Arras hoard discovered on May 2nd, 1922 in France. The actual discovery was in the village of Beaurains which lies just to the south of the larger town of Arras in Northern France. 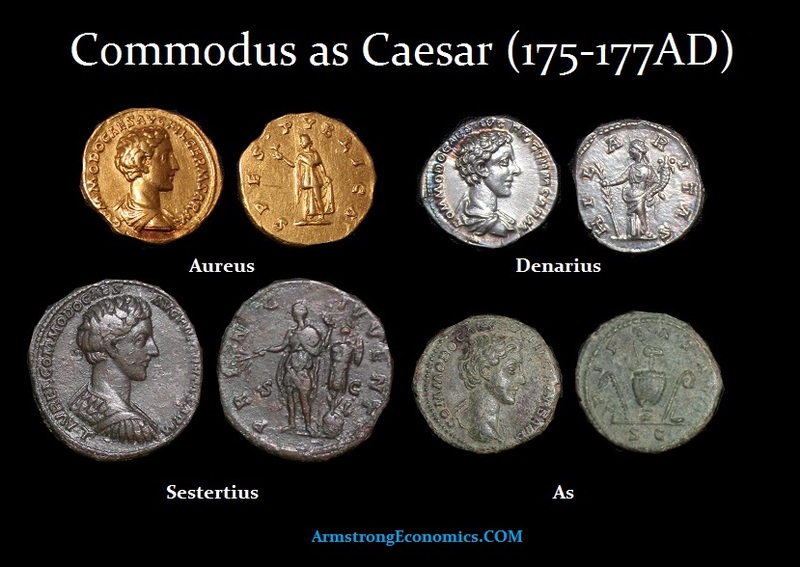 There a group of Belgian laborers, working at the northern edge of the village, stumbled upon a hoard of over four hundred coins, approximately 40 late Roman medallions, and a variety of cameos and jewelry buried in a silver vase that was itself protected by a clay pot. Unfortunately, these valuable objects were left unprotected during the first night after their discovery and many were stolen. 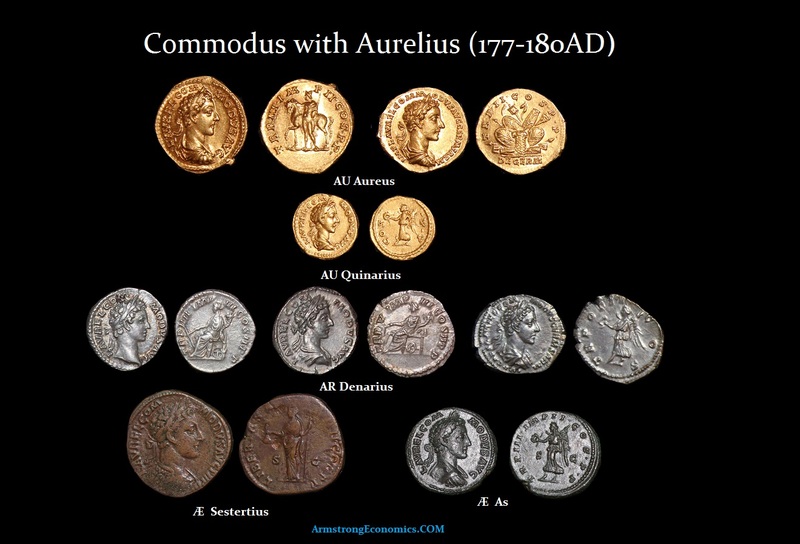 The coin of Commodus as Hercules mounted was in that hoard. 177 TR.P. (later TR.P.II.) IMP. IMP.II. COS. AVGVSTVS. P.P. 179 TR.P.IIII. – V. IMP.III. COS.II. 180 TR.P.V. – VI. IMP.IIII. P.M.
181 TR.P.VI. – VII. COS.III. 182 TR.P.VII. – VIII. IMP.V. 183 TR.P.VIII. – VIIl. IMP.VI. COS.IIII. PIVS. 184 TR.P.VIIII. – X. IMP.VII. BRIT. 185 TR.P.X. – XI. FELIX. 186 TR.P.XI. XII. IMP.VIII. COS.V. 190 TR.I’.XV. – XVI. COS.VI. 192 TR.P.XVII. – XVIII. COS.VII. Based upon the evidence, Commodus would seem to have received the tribunician power either very late in 176 AD sometime after December 10th or in early in 177 AD. 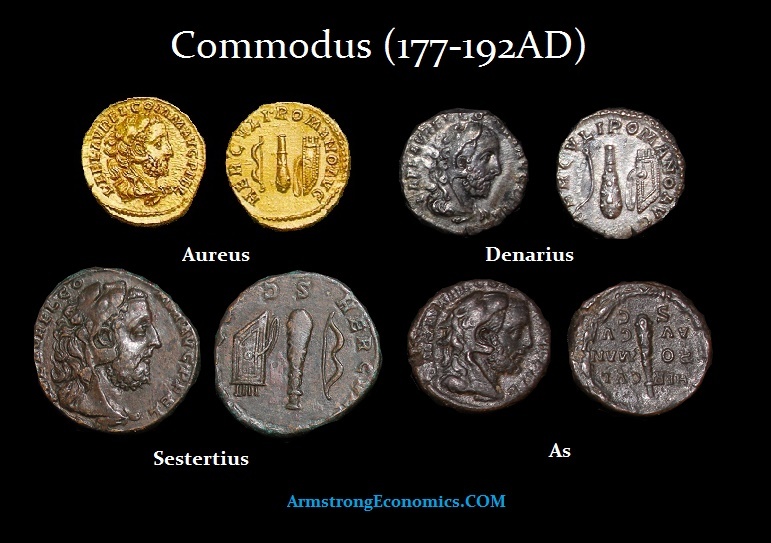 In either case, the coinage of Commodus show him as TR.P. early in 177, but then suddenly he changes to TR.P.II. and advances to TR.P.III on December 10th. The only explanation that appears at least likely is that after the TR.P. issue of perhaps late 176 or early 177, it was decided to put back the date on which he had first received the tribunician power to before December 10th, 176 AD. For what purpose one cannot be certain. It simply appears that some backdating scheme arose. Subsequently, his tribunician power was renewed each year on December 10th. L . AVREL . COMMODVS AVG. L . AVREL . COMMODVS AVG . TR . P.III. L . AVREL . COMMODVS AVG . TR. P.IIII. IMP. L . AVREL . COMMODVS AVG. GERM . SARM. M.COMMODVS ANT . P. FELIX AVG . BRIT. M.COMMODVS ANTONINVS AVG . PIVS.